ParaAxial is a German R & D project entitled “Parametrische Entwurfstechniken für Axialmaschinen” (Parametric design methods for axial machinery). Co-financed by the European Union (EU), the two-year project started in July 2006. 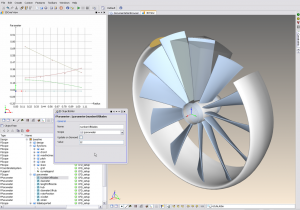 It aimed at developing and enhancing parametric methods for the design, analysis and optimization of turbomachinery with focus on axial flows. Within the R&D program, FRIENDSHIP SYSTEMS developed methods for the parametric design of axial machinery like propellers, axial pumps, compressors and turbines on the basis of the CAESES. Generation of new modeling methods, e.g. Results of the ParaAxial project were presented to the public at expert conferences and exhibitions in 2008, for instance Turbo Expo, Shanghai Trade Fair, WindEnergy, SMM 2008, Numeca User Meeting and too at the 2008 NAFEMS conference in Wiesbaden. At the latter, FRIENDSHIP SYSTEMS introduced ParaAxial results and published a paper on “Direct Coupling of CAD and CFD for the Design of Functional Surfaces” which fundamentally based upon the project’s findings. The paper is available on our papers section. Under the umbrella of the research and technological development program for small and medium-sized enterprises (SMEs), the scheme was cofinanced by the EU in collaboration with the Ministry of Economics of German Federal State Brandenburg (Ministerium für Wirtschaft), the economic development agency ZAB (ZukunftsAgentur Brandenburg ZAB) and the investment bank of German federal state Brandenburg (Investitionsbank des Landes Brandenburg ILB).